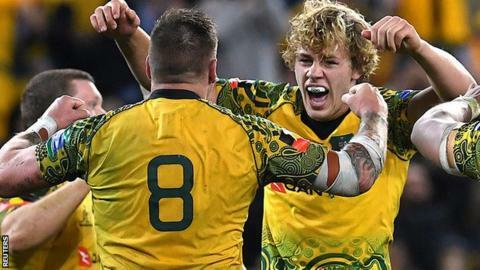 Reece Hodge kicked a 53-metre penalty with two minutes remaining to seal only Australia's second win in 19 games against New Zealand in the last match of the Bledisloe Cup in Brisbane. The All Blacks, who retained the trophy in August, led by just a point at half-time despite a dominant performance. Marika Koroibete's try and Hodge's boot after the break put Australia ahead. Hodge then kicked the long penalty to ensure a win over the All Blacks for the first time in more than two years. The Wallabies, wearing jerseys specially designed to honour Australia's indigenous players, took an early lead through Hodge's 70-metre run to the line. However, Waisake Naholo levelled things for New Zealand and Lima Sopoaga's conversion put the visitors ahead. The immense Israel Folau skipped over just before the break to keep Michael Cheika's men in touch. And although Rieko Ioane crossed for Steve Hansen's side, Koroibete's effort and Hodge's thumping kicks off the tee sealed a famous win for the Wallabies. Only two matches in the three-game Bledisloe Cup series count towards the Rugby Championship, the annual contest between Argentina, Australia, New Zealand, and South Africa. New Zealand won the Championship for the fifth time when they defeated South Africa earlier in October. The Bledisloe Cup is the historic contest between Australia and New Zealand, with the All Blacks having won the last 15 editions of the competition.